One year ago today, Kyle and I sat in a Russian courtroom pleading our case as to why we would make good parents to Addison, a Russian orphan with Down syndrome. 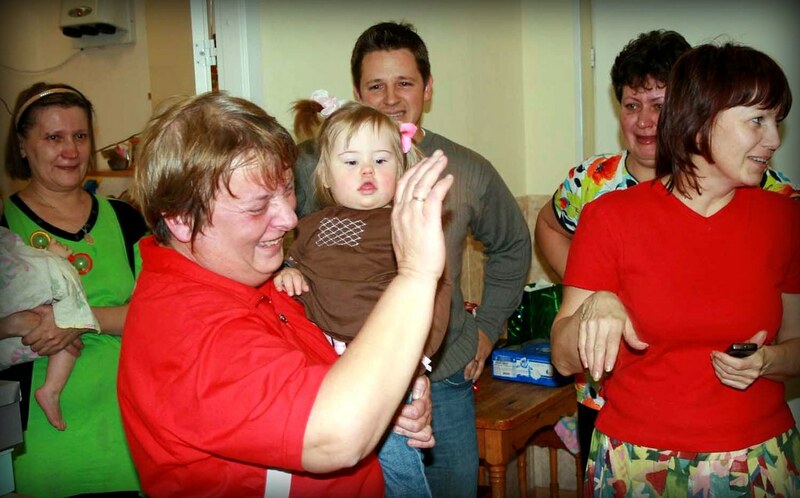 Trying to make them understand why we would want a child with Down syndrome was another story. In the end, I think they understood ... and I think ... I hope ... they were inspired. The judge granted our adoption ... effective immediately ... meaning the standard 10-day waiting period was waived and we were able to take Addison from the baby home immediately! Excerpt from our adoption blog ... 11/12/08 ... Court Day ... Yesterday we got to meet Addison's favorite caregiver. She must have been on vacation when we were there for our first trip, because I don't remember her. She is so sweet and Addison clearly adores her. She was singing nursery rhymes to Addison and she was totally doing all the motions to them ... I loved it! Today our translator told us that the caregiver asked our translator this morning when we would be coming to take Addison for good. She said she couldn't handle it and didn't want to be there. She said she has been crying for days and she just doesn't want to be there. That makes me so sad! I almost feel guilty for taking her. I can't imagine the pain this caregiver is experiencing ... to have raised Addison for the first two years of her life, and now she will be gone to another country. It makes me teary eyed just thinking about it. I told our translator I was sad that we wouldn't see the caregiver because I really wanted to take a picture of her and Addison. I also wanted to video tape her singing the nursery rhymes to Addison so that I can play them for her when we get home. It turns out, however, that we are picking Addison up at a different time than we originally thought, so we may end up seeing the caregiver tomorrow after all. And we did! She was there and I was so happy about that. I didn't want her to regret being able to say goodbye ... and I just wanted to hug her for loving Addison so much during her first two years of life. Nika with her favorite caregiver during her going away party. Excerpt from our adoption blog ... 11/13/08 ... Gotcha Day ... We got to the baby home and met the director for the first time. She was so sweet and we gave her a gift that we bought for her. She was very grateful that we are adopting Addison and she essentially meant that if it weren't for us, then she may not have ever been adopted. I got teary eyed and then we went to visit the social worker to give her a gift, and she told us the same thing as the director and I got teary eyed again. Then we went up to Addison's grouppa (aka: her "family unit"). There were four caregivers there and yes, her favorite caregiver was there. We gave each of the caregivers gifts that we bought for them and they thanked us. Our translator told us that we could get Addison dressed in the clothes that we brought for her, so we did. Good grief ... that really made her look like Payton! LOL. There is another family that we know that is adopting a little boy from Addison's grouppa. We had court the same day and they also had their 10-day waiting period waived, as their little boy has a heart defect. They had left the room to change him and all a sudden he came flying through the door to show his friends his new digs ... a Nike warm-up suit. It was so cute! He was so proud and so happy ... it was so fun to watch his reaction, since he is old enough to know what it means to have new things (he is almost four years old). That alone almost made me cry. LOL. So both of our families joined the caregivers in another room and they were already crying. I lost it, Kyle lost it, our translator lost it ... we all just cried. How could you stand there and watch this and not lose it? Seriously. I know they are so happy that these kids now have families, but their hearts are also aching. I promised them that we would send lots of pictures so that they can rest assured that Addison is doing great and that she is in a great place. I know the "not knowing what happens" is the hardest part for them. It would be for me too. Before we left, we let Addison's favorite caregiver have her time with her ... she was so sweet. She has given her entire soul to our child and I just hugged her and we cried. What a special lady. It has been a whirlwind of a year. Nika has adjusted beautifully to our family and everyone adores her. Mason just said to me the other day, "Mommy, I love Nika. She has such a cute little face." The changes that Nika has made over the past year are amazing ... physically, developmentally, emotionally. 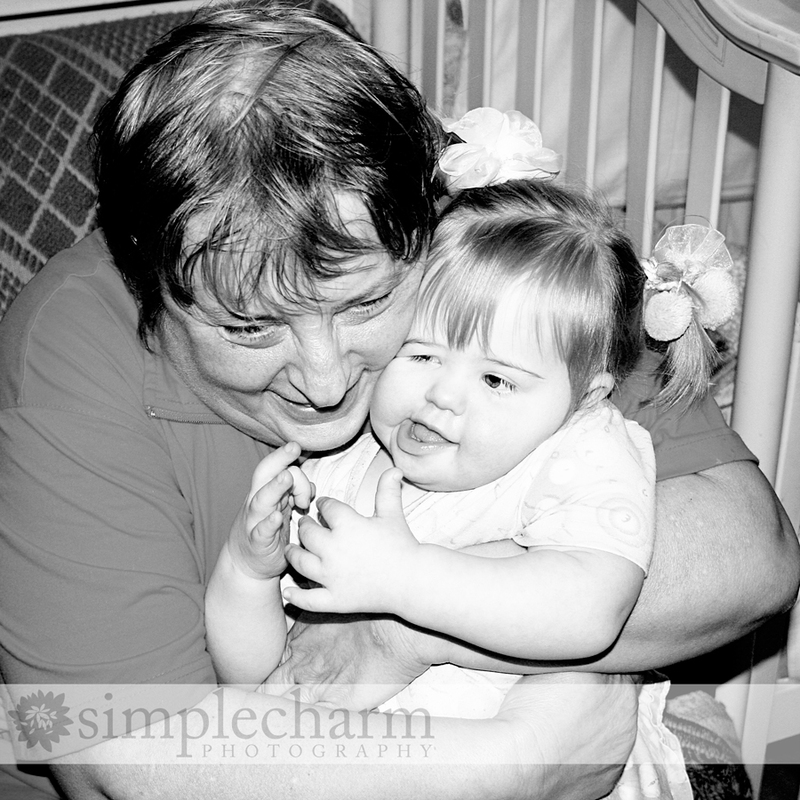 She is doing awesome and we are working with her to move her past any little quirks that she has (i.e. regressing into herself and refusing to participate in one on one therapy). She has definitely come out of her shell and she wastes no time telling us "No!" right along with her siblings. Ha. Sassy little thing. I get all emotional reading this. I hope to get to experience something like this someday. I can't believe how much older she looks in just one year! Happy Gotcha day! So hard to believe it's already been a year! She is so lucky to have such a loving home and family. Wow! She is such a total doll! 11/13/08 "Oh man.....tears just pouring....what an emotional day for everyone. I read this post to my 7 year old son who happened to be sitting next to me and as I started crying...he started crying too. He then said, "Mom we need to adopt a baby too". Wow, what a journey you are on! We are praying for safe travels and a smooth transition. Addison is absolutely adorable! Cheri and my choked up 7 year old, Luke :)"
I am curious if you have you kept in touch with her favorite caretaker or sent them pictures of her? she has grown so much, and so darn cute! Happy Gotcha Day! I can't believe it's been a year already. She's gotten so big and is just too cute. Such a perfect addition to your family. HAPPY GOTCHA DAY!!!!! I can't wait to see what Kellsey does in this next year! 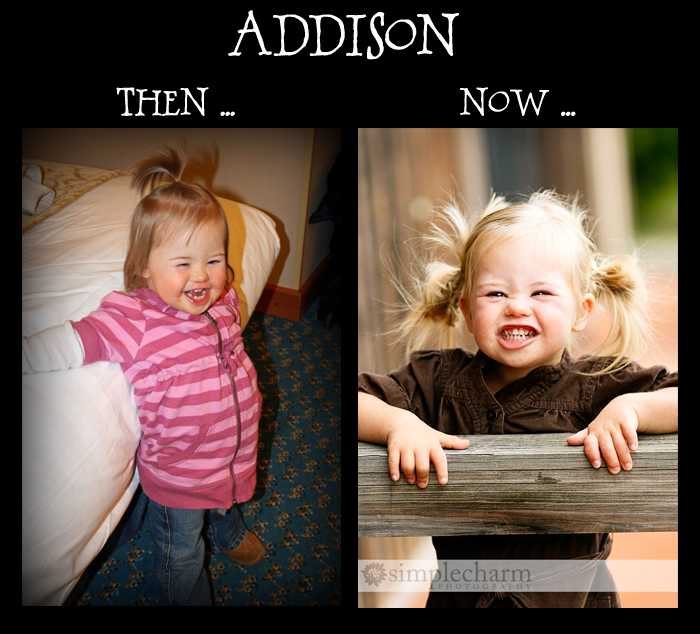 Addison has changed so much!!! She is so freaking cute. I can barely remember you all without her! I have tears coming down my face after reading this!! What a great fairy tale story!! Happy Gotcha Day!!! Love the story of Nika and her beautiful little face! I can't believe it has been a year already! I remember reading about your Gotcha Day last year. Nika has changed so much! She is the sweetest little girl and I am so happy for her and for you! WOOHOO for gotcha day!!! I cried last year when I read that post. I love that picture of everyone crying because it showed they really cared, and the fact that Kyle appears to be holding back the tears gets me too. We are so blessed to know Nika and know how much she has blessed your family!!! aww this makes me so teary eyed.. how blessed you are to have such a wonderful family!! I remember! Oh, Bethany! This particular post touched me the most! The fact that you and Kyle were "saving" her and how the ladies at the baby home loved her so. Thanks for bringing me back! Remember when I cried (weeped) everytime I read your blog this time last year. You got it,.......crying again! Nika is the sweetest thing and has the best family. im such a baby, im tearing the same way than a year ago... addison is beautiful, and there is no doubt of how much love can do. she seemed happy, but now she is complete!